LIVE Apologetics will equip and encourage your students to clearly and effectively explain why they believe what they believe. And they’ll be prepared to respond to some of the worldviews they encounter. Help students living in a pluralistic culture more clearly understand, explain, and defend their Christian faith with the 17 lessons in LIVE™ Apologetics. Lessons focus on several major themes, including an overview of apologetics, understanding who Jesus is, responding to specific worldviews (including atheism, agnosticism, Buddhism, and Islam), and explaining their faith to others. You’ll be able to equip and encourage students to clearly and effectively explain why they believe what they believe. Save Time: Save hours of planning time by using our complete, ready-to-go lessons. Maximize Impact: Strengthen students’ Christian faith so they can share the good news of Jesus with others who need to hear it. In a pluralistic culture filled with numerous voices and worldviews, how can we help our students more clearly understand, explain, and defend their Christian faith? The 17 lessons in LIVE Apologetics will equip teenagers to do just that! LIVE Apologetics will equip and encourage your students to clearly and effectively explain why they believe what they believe. And they’ll be prepared to respond to some of the worldviews they encounter, including atheism, agnosticism, Buddhism, and Islam. These 17 lessons will equip and encourage your students to clearly and effectively explain why they believe what they believe. And they’ll be prepared to respond to some of the worldviews they encounter, including atheism, agnosticism, Buddhism, and Islam. 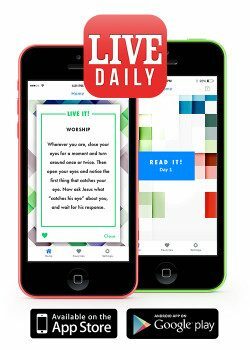 LIVE Apologetics includes access to the innovative new LIVE Daily app that sends “in the moment” prompts and ideas for living out their faith. Each day’s idea taps into different ways that people learn—through serving others, reading Scripture, tackling questions, looking toward Jesus, and worshipping in ways beyond singing songs. "This curriculum asks great questions to the youth of our church. They are learning a lot about what it means to be faithful in the Christian walk and learning a new respect for those following other religions. This is not a religion-bashing curriculum... it's one that explains why we believe what we believe and why others have their own beliefs."